Available in 6 colours and with a full range of accessories including the Doona Rain Cover, Essentials changing bag, All Day changing bag and the Snap On Storage in a range of colours to match your Doona. Click here for information. Having a second child I needed something for convenience and this fitted the bill perfectly. Running errands and general day-to-day chores simply getting the baby in Doona and using it easily to get out of the car and it converts to a pushchair is so easy and quick. Plus I have a free boot shopping space. I simply love it, only wish I’d known about it sooner so that I could of had the simple experience with my first born. I bought the Doona for my 2nd child and I have absolutely no regrets! 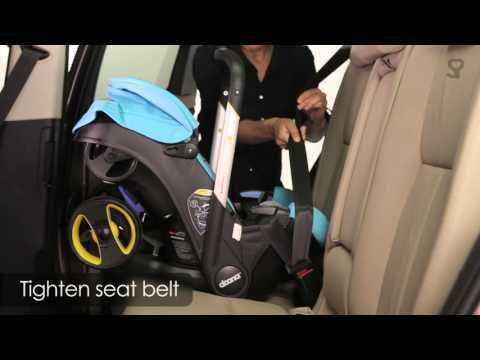 No need to lift heavy carseats as the Doona gets your baby around on wheels. The Doona is also the most padded carseat Ive ever seen which supports a newborns head perfectly . Amazing! Just so convenient and easy to use would highly recommend - especially to anybody who also has a toddler - makes life so much easier! This is amazing! I have a bad back and having the wheels means I can it to the car and back and round the shop without any pain. It also manoeuvres very well and is easy to use. I would strongly recommend! Only down side is that all of the attachments are incredibly expensive.